For the first Mario Party on Wii, up to four players roll virtual dice and move around the game boards (ranging from a haunted house to a moving train and a treasure island) before competing in crazy minigames that make full use of the Wii Remote; such as tightrope walking, skipping, snowboarding, boat rowing, lassoing and even cake decorating. 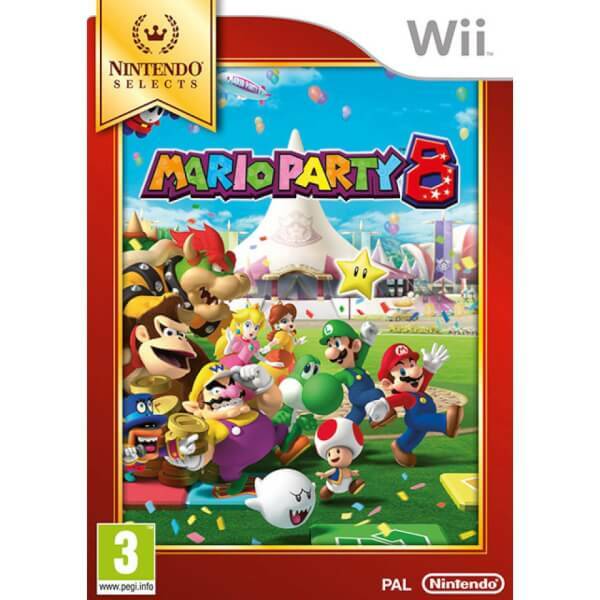 As well as the main, madcap multiplayer game, Mario Party 8 also features a special single-player only mode, a minigame-only mode, a bazaar where you can unlock new minigames and goodies, and a mode made specifically for playing as Mii characters! Choose from 14 classic Mario characters, including Blooper and Hammer Bro. Note: this game is now available as part of the Nintendo Selects range, featuring great games at a great price. Find out more about Nintendo Selects.